Merseyside is a metropolitan county in the North West of England. 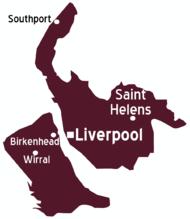 It consists of the boroughs of Liverpool, Knowsley, Sefton and St.Helens on the east of the River Mersey and the borough of Wirral on the west of the River Mersey. This page was last edited on 3 April 2016, at 16:13.